Quinoa is such a crazy grain. Are you a rice? Are you a pasta? I can use you as cereal? Say what?! Needless to say my love for quinoa abounds, especially as a vegan who looks for protein from non-animal sources, quinoa is like the little black dress of my cabinets. Dress it up, dress it down. Here, we are accessorizing our staple with shiny sandals and a laid back fancy necklace. It’s a throw it on deal, simple and stunning. This dish came to be like my favorite outfits, throw it all in and see how it looks (or in this case, tastes), adjust until comfortable and just live in it. I love cooking a big batch of quinoa and using it in a little bit of everything. Only recently have I discovered the magic of quinoa as cereal. How didn’t I know about this by now? Fruit, almond milk, quinoa, done. Full until lunch ( a requirement if you’ve eaten all of your work cubicle snacks) and hardly any work involved. I got lucky and found apricots and strawberries on sale, but feel free to throw in whatever you have on hand. 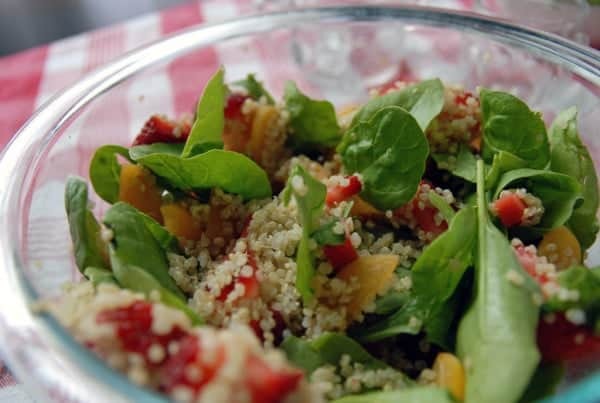 Throw on a summer dress and throw together this strawberry and spinach quinoa salad friend, it’s patio eating time! Combine all salad ingredients in large bowl, tossing to combine. Whisk together dressing ingredients and pour over salad, to taste, tossing to coat thoroughly. Would also be great with almonds or a handful of toasted walnuts. This looks so refreshing! I love throwing things together to create something new and interesting! Absolutley! I love your blog Kelly! I LOVE quinoa salads!!! This Spring version looks divine, lady love! What a simple and lovely salad! I love how versatile quinoa can be! A definite staple for us vegetarians and vegans! I love quinoa and especially in salad form! Looks so light and fresh! What a fun idea! I haven’t made anything with quinoa yet, sadly. I bought some at the store the other day, and I have yet to use it. I always tend to let mine sit, but I’ve discovered it’s so versatile! Love the idea of spinach with quinoa. Will try this sometime. ooh yes, please: give me a big bowl right now! 🙂 Yummm! I love quinoa! to the point where sometimes I think I have a quinoa problem….